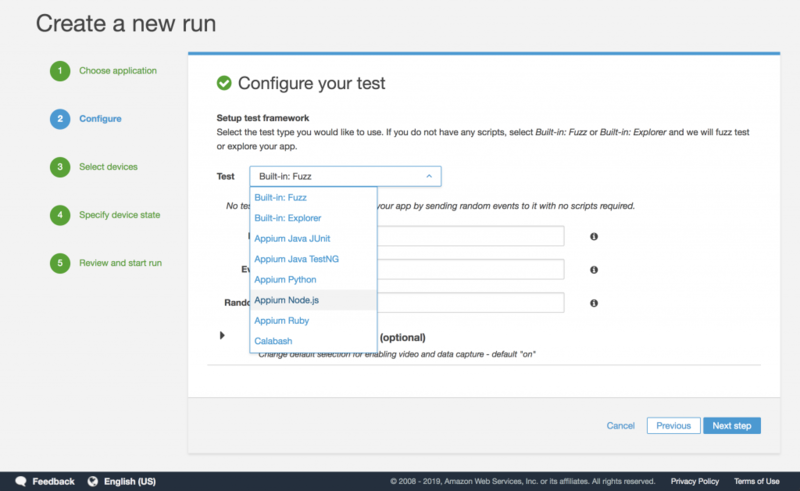 In this blog post, we’re going to dive into how to use AWS Device Farm to run and test a sample mobile app using Node.js and Appium. With Device Farm, you can view videos, screenshots, logs, and performance data to pinpoint and fix issues. This helps you improve quality before shipping your app. Device Farm lets you test your application on a shared fleet of over 2,500 real devices, or on your own private device fleet in the cloud. Note: If you don’t have a test already written or an application to test, we provide them for you in the following section. Continue to the next step of creating the demo test. If you do have a test already written and an .ipa or .apk file, skip to the section “Packaging the test files for Device Farm”. 1. You first test to see that the application loads. 2. Next, you run a loop that checks to see if a button exists, chooses the button, and then goes back. The loop runs 5 times. Note: The code provided is targeting the example .apk that we’re providing you for the tutorial. If you bring your own .apk, you need to write your own test. Your test is now written, bundled, and ready to go. Finally, export your .apk file if you have an existing application, or download the example Android .apk file. Now that you have a test written and an .apk to run the test on, navigate to the Device Farm console at https://console.aws.amazon.com/devicefarm. Choose Create New Project, and give the project a name. Choose Create a New Run. Choose the Android / iOS button (to specify a native application). Give the Run a name, and choose Next Step. Then, you’re given a default TestSpec YAML file that describes some configuration for your test. In the test: phase, you need to update the command: property to be the command that you use to execute your mocha test. 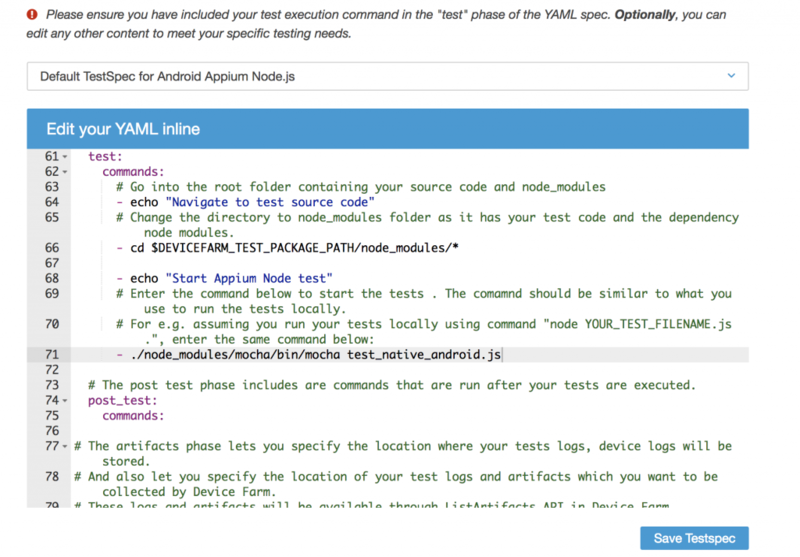 Note: In this YAML file, you can also set other configuration for your test environment. For example, you can set the node environment that you want to be running in, post-test command , and ADB device commands (like turning off animations). After the test has been saved, choose Next step. In the next screen, you’re given the option to choose a custom set of devices (a device pool) or a default device pool. 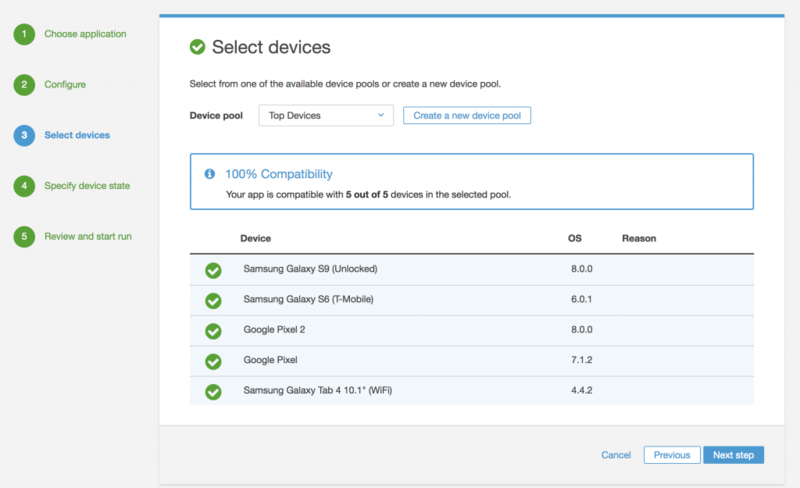 Either choose the default device pool, or create your own by using the devices that you want to test on. After you’ve chosen your device pool, choose Next step. In the next screen, you’re given some options to specify the device state. You can set custom device settings that you’d like to configure on each device (things like geolocation, Wi-Fi status, etc.). Either keep the defaults or configure your custom device state, and then choose Next step. Now, the test is ready to run. Choose Confirm & start run. After the test is complete, you should see the test results overview in the dashboard. To view the details of the test, choose the test name. 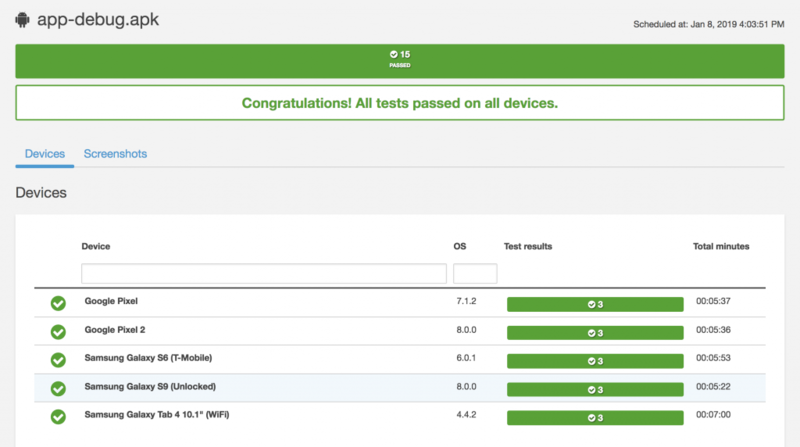 In this screen, you can view a test overview for each device. You can choose an individual device to view details of the test. After choosing an individual device, you’re taken to the device details page. You can view details of the individual test, including videos of the test, test logs, app performance metrics, and more. To learn more about Device Farm, check out the getting started information and documentation. To view all available devices in Device Farm, see the devices list.